The South Australian honeybee industry is set to follow the latest in biosecurity best practice with changes to the Livestock Regulations 2013 to take effect this month (April). The amendments which come into effect on Thursday 19 April align with the Australian Honey Bee Industry Biosecurity Code of Practice, which has been endorsed nationally and interstate. Beekeepers must record specified biosecurity related management practices that are undertaken. Bees must be kept in approved hives, including being bee proof, with honeybee access only permitted via specifically designed entrances, whilst swarm catch boxes must only contain foundation, and if not located at the apiarists residence, be additionally branded with their name and telephone number. Beekeepers must provide water suitable to sustain bees at a distance of not more than 200 m from any hive. Beekeepers with 50 or more hives must successfully complete a course in bee pest and disease management approved by the Chief Inspector. Beekeepers will be required to view and understand information on notifiable conditions of bees as part of the annual registration process. The honey bee industry nationally developed the Australian Honey Bee Industry Biosecurity Code of Practice, which was endorsed by the Australian Honey Bee Council in July 2016. 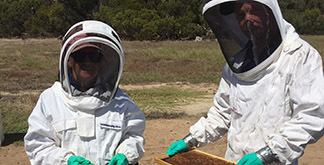 There were 2034 beekeepers registered with Biosecurity SA in 2016–17, an increase from 1100 in 2015–16. There was a total of 68,000 hives recorded in South Australia in 2016–17. Honey production contributes about $11m to the South Australian economy, while the value of pollination services has been estimated at $550m. Honeybee biosecurity comes within the scope of the Livestock Act 1997 and Livestock Regulations 2013 administered by Biosecurity SA. The honey industry is a vital part of our agricultural sector so we need to ensure the best possible management of bees which are vulnerable to so many diseases. Good biosecurity is everyone’s responsibility – from the hobby beekeeper with one hive to the major commercial apiarists. South Australia is recognised internationally for our honey products. Only through strict biosecurity measures can we continue to protect such a precious industry and the livelihoods of hundreds of families. These new changes to the livestock regulations will underpin improved practices and accountability which in turn will drive productivity so everyone benefits. Acknowledgement: Reproduced from a news item by Primary Industries and Regions South Australia.